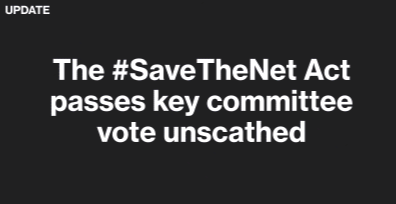 Today the Save the Internet Act (HR 1644) passed a crucial vote in the House Energy and Commerce Committee, despite a wave of disingenuous attempts by telecom funded lawmakers to derail the bill or gut its key protections with bad amendments. The bill was reported out of the committee largely unscathed, and will now head to the House floor as early as next week. Digital rights group Fight for the Future has been leading an online campaign to ensure the bills passage, rallying hundreds of thousands of Internet users to watch the livestreams of the committee votes and contact their lawmakers ahead of the floor vote. “Telecom lobbyists should just give up now. Despite ISP giants like Comcast, Verizon, and AT&T spending hundreds of millions of dollars on lobbying, misinformation campaigns, and buying influence through campaign contributions, they’ve failed to fool the public and efforts to restore net neutrality are moving forward. It’s embarrassing watching telecom shills in these committee votes attempt to turn this into a partisan issue when it’s actually quite simple: no one wants their cable company to control what they can see and do on the Internet, or manipulate where they get their news, how they listen to music, or what apps they can use. Bolstered by Internet activism and massive public attention, net neutrality supporters on the Energy and Commerce Committee successfully defeated a swath of terrible amendments that would have completely gutted HR 1644. Two amendments did pass, one that simply clarifies the initial intent of the bill, and one that creates a one year exemption from transparency requirements for small ISPs with less than 100,000 subscribers. While such an exemption is unnecessary, given that many small ISPs say they are happy to comply with such requirements, the amendment is closely aligned with the intent of the 2015 Open Internet Order, and does not undermine the core protections within the bill. Fight for the Future intends to continue organizing Internet users en masse to fight for the restoration of net neutrality and ensure the clean passage of the Save the Internet act.